1. 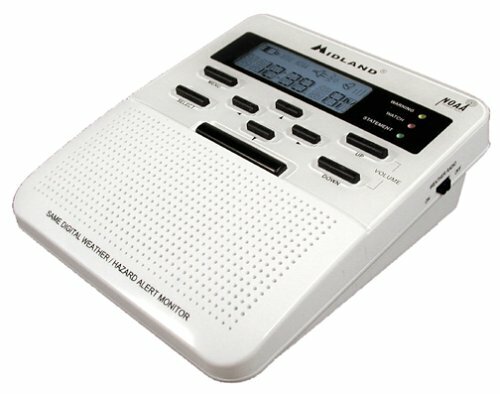 Midland WR-300 AM/FM Weather/All Hazards/Civil Emergency Alert Monitor with S.A.M.E. Stay alert to conditions that affect you with Midland's WR-300 weather/all-hazard radio. The unit offers S.A.M.E. technology (Specific Area Message Encoding), which preprograms the device to receive only those warnings that apply to your local area--you can choose state, county, and/or nearby counties. The single-speaker radio offers 30 programmable county codes, AM/FM tuning, date, time, alarm functions, and even auto switch from AM/FM to pertinent all-hazard alerts. For tuning, the radio employs drift-free PLL (phase-lock loop) technology and an easy-to-read blue, backlit LCD. You get a convenient, 10-alert memory, and you can add, edit, and remove unwanted alerts at any time. The radio uses the supplied AC power adapter or four AA Batteries (not included). This is a wonderful radio. Most of the problems discussed by prior people are not problems at all. Just read the directions carefully and you will have a great experience with this radio. The only downside is that this radio does not allow you to adjust the backlight length. The four seconds or so that it stays lit is not enough sometimes. Overall, this is the best weather radio I have ever owned. Many aspects of the unit seemed good but I returned the one I ordered because in some locations in my apartment the radio received some type of commercial radio or TV signal. The audio coming from the radio was clearly not from a weather radio station. My older Radio Shack weather radio does not have this problem. After reading the previous reviews for this product, I was a bit weary. However, after the purchase, I was quite impressed. The controls work fine, even in "silent" mode. No faint broadcasts. I wonder if that person was too close to the transmitter?? Radio controls are nice and easy to program. Reception is very good with minimal distortion on all bands. The couple of things I did notice that I would prefer would be that the backlight stay on just a bit longer, 4 seconds on mine. The other would be to display the alert's effective time. That time is not displayed, but the alert light stays lit for the effective time. All in all, a very good price to pay for safety! I purchased this product and I had to return it the next day. I then received a replacement radio with the same technical issue: The weather radio would not turn off even when in the "silent" mode. It may be possible that the radio issues the weather warnings, etc., but who wants to listen to the radio going 24 hours a day? When the radio is placed in the silent/mute mode you can hear a weak NOAA signal in the background. Obviously this radio was poorly engineered, constructed incorrectly, or had defective parts placed in the unit. Why would you want to pay money for this radio only to put a towel on it so you can't hear it? Save you money! I would recommend the WX500 Uniden weather radio (although it does not have AM/FM) or the hand-held Midland 74-250 with SAME. It is my hope that Uniden stays in the weather radio market, as their WX500 is the best base weather radio I've ever had. 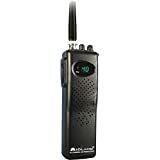 Having a CB radio while traveling can be an invaluable tool for emergencies and for keeping up on road conditions, and the Midland 75-822 40-channel handheld CB is one you should definitely consider. It comes with everything you need to get started in a hurry, including a battery pack for times you want to run the unit on six AA batteries and a cigarette lighter adapter for battery-free operation in your car. 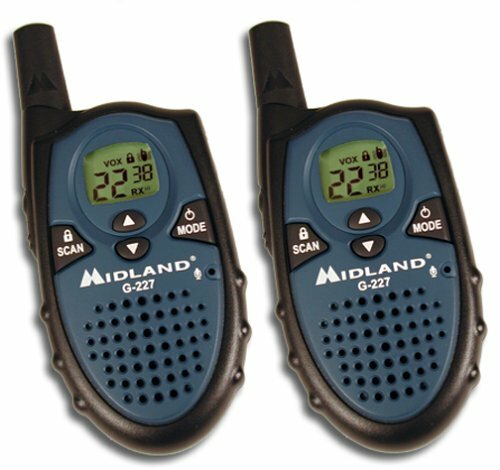 The Midland 75-822's design is ideal, with a push-to-talk button on the side, squelch and volume knobs, and a small LCD screen that displays the current channel, signal strength, and a variety of other useful information. Several buttons on the device can be used for scanning, whether quickly flipping between the emergency channel (9) and the standard highway channel (19) or activating the LCD's backlight. 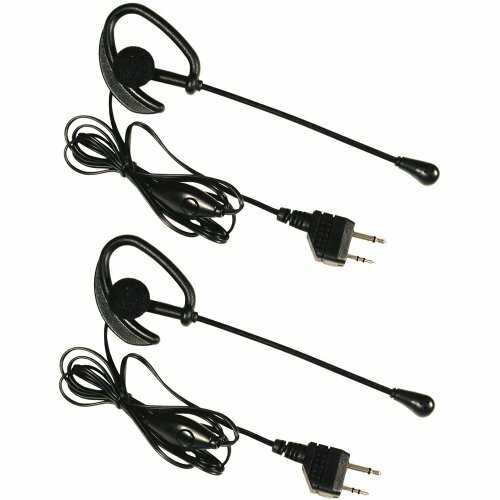 The unit also comes with a short, flexible antenna. Overall, the 75-822's portability is excellent--comparable to a child's walkie-talkie. Unfortunately, the unit's compactness hampers its usefulness, because the relatively small antenna has a hard time pulling in distant signals. In our tests on local highways and on the interstate, transmissions rarely could be heard from more than half a mile away. 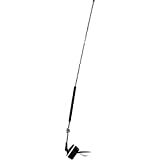 However, when we connected the Midland 75-822 to a whip antenna that was several feet long, the range increased considerably. As a result, we recommend investing in a better antenna before using the device in your car, although the radio still works well for communicating with nearby semis when you're trying to find out the source of a traffic jam. All the complaints I've read about this scanner are pretty pointless. This is the best Hand Held scanner I've ever owned. Go to Sears or Best Buy, see what HH CB's they have in, Probably just one, the Cobra 37 ST. 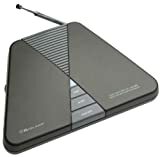 Does that have channel scan, 5 memories, memory scan, freq. display, REAL mobile adpater not just a car power cord, NOPE. How much do they want? $40 in Best buy, and get this, $79.99 in sears, check their website. The problems with range come with any handheld. I dont see the problem, take any hand held in a car and its range will go way down, But midland is only company that provides you with an external antenna hookup/power cord combined and make your radio the size of most mic's, you cant go wrong. The best you'll get from others is a DC power cable, but no way to connect an external car antenna to it. and they will still be full length. This scanner is the BEST on the market, and I cant belive the price. Would be nice if it has USB/LSB but hey, you cant get everything. It covers all the bases. This is a great radio. It is really easy to use in a car and out of a car. If using in a car you should buy an external. The attached antenna doesn't work well with the metal from the car. Excellent CB Radio! Amzing Value. This is an incredibly awesome CB RADIO. I have been using CB's for years. This one has great features and great reception. I was so impressed I ordered two of them! A must have for any CB Radio enthusiast. buy the attatchment attenea, it really helps on the highway. 3. Midland WR-100 Weather/All Hazards/Civil Emergency Alert Monitor with S.A.M.E. Stay alert to the conditions that affect you with Midland's WR-100 weather/all-hazard radio. The unit offers S.A.M.E. technology (Specific Area Message Encoding), which preprograms the device to receive only those warnings that apply to your local area--you can choose state, county, and/or nearby counties. The single-speaker radio offers 25 programmable county codes, access to 7 NOAA weather channels, time/date and alarm functions, and a choice of voice, siren, or tone alert. In the event of special warning broadcasts, the monitor is automatically activated along with a loud tone, an LED light and an alert message on its 8-character LCD. Emergency weather bulletins include alerts about tornadoes, hurricanes, floods, ice/snow storms, and other severe weather. Other emergencies might include Amber alerts, explosions, fires, or hazardous chemical spills. The radio uses the supplied AC power adapter or 3 AA backup batteries (not included). Batteries should give you approximately 24 hours of continuous operation; the clock will run for at least 10 days on batteries when the monitor is turned off (using the monitor on/off control). I highly recommend this model to anyone who might live in a dangerous weather region, I live in the heart of tornado alley. This is a great product which has not failed my family yet. Please make sure you check into the products you need. Purchased this radio and set it up by the manual. This radio will NOT operate with AC power alone. It also requires 3 AA batteries to operate the digital readout. Within the first 3-4 days the batteries were drained dead and unit would not operate. I changed to new batteries and again in about 3-4 days, thoses batteries were dead. I replaced with the 3 set of batteries and once again, about 3-4 days they were dead again. The radio was set on "Alert Only" so, therefore would not constantly play, only when receiving a weather bulletin. Only once during my 2 week ownership did the unit alert, and that was during a weekly test from NOA radio. This unit was absolutely terrible. Thank goodness for the good people at Amazon, I was able to return this crap back at no cost to me, and a full refund. I strongly suggest that you look at another specific brand besides a battery eating monster like this one was. Very Disappointed in this brand. This handheld CB radio comes with seven watts of input and four watts ofoutput (the FCC maximum allowable.) This model is 33% smaller than its predecessor.Other highlights include: automatic noise control, automatic gain control, a bright LEDdisplay, high/low power switch and a flexible antenna. This mobile radio operates onnine AA batteries. Battery saver circuitry helps saves energy; there is also a 12V DClighter socket adaptor included to help save batteries. I have ordered this product (the Midland 75-785) and it is great I can hear everyone talking on the channels and the ones who are in range I can talk to. I'm glad I got it. The shipping was faster than I expected. I'm very happy with my product. And if you order one I know you will be too. I bought this as a replacement for my fullsize cobra unit that was "borrowed" from my car without my knowledge. Overall I really like this unit. It is small, compact and can be easily moved from vehicle to vehicle. The best part about it is that you can either have it wired in the car or run it as a handheld. The only downside to the unit is the fairly small speaker, but if you turn down the radio there really is no problem. In terms of performance, I think this little radio works better than any I have had before. I am able to pick up the NOAA weather stations much clearer than I was before. Overall a great product for the price. 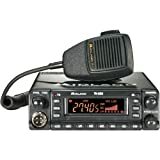 To me this radio works better than the small two way radios, thats why I bought it. Yes it's a little bigger than the 2 way radios, but what I really wanted was more clearly transmission and a longer range which is what I got. Nice radio. gee Luke did you want the thing deivered before you ordered it? I guess maybe you should have spent the extra 15.00 bucks. Amazon service is fast! This is a great product. I waited 4 months for this radio, it looked wonderfull, but looks can be decieving. The raido fit right where I wanted it to go. But when I started using it problems became apparent. The controls were hard to use. The squelch and volume are on one stalk control and are hard to set with out moving each other at the same time. There is no noise blanking system. The squelch circuit is very quick to open therefor letting in a lot of impulse noise that would not be let though on other radios. Then the last straw, the latches holding the removable face plate broke! They were made out of PLASTIC! The radio is going back! 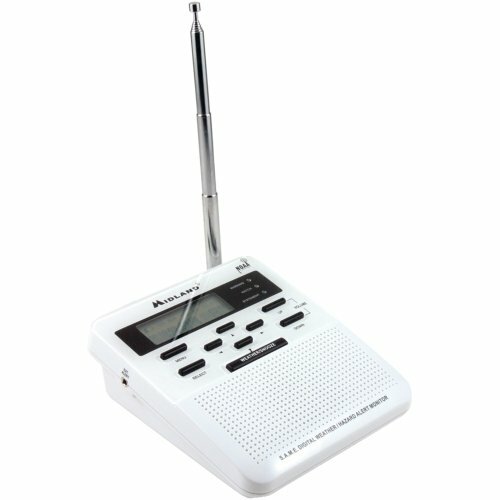 LCD screen indicates channel and 8-character warning messages such as "tornado"
As an unobtrusive weather radio that works, this one is it. It has full featured S.A.M.E. capabilties. It will store up to 15 county identifiers (FIPS codes) The receiver is excellent and audio is clear & quiet. I have owned this radio for almost a year and still keep the manual close by. It is sort of a pain to program. But when it comes to function it is great. Mine came with an AC adapter. It has 9V battery backup, external antenna, and alert jacks. Speaker and warning signal volumes are adjusted individually. The alerts can be set for tone or voice. The manual shows over 35 types of alerts it will display on the LCD screen as well as different tone patterns. And as the NWS adds new alert capabilities it will receive them automatically. Three different colored leds show "warning", "watch" or "statement". Up to three different overlapping alerts with overlapping effective time periods can be stored and reviewed by scrolling the display. The display is rather rudimentary, but the performance of the radio makes up for it. When it is connected to external power (it can be used in the car with the proper cig plug) the display is constantly illuminated. It is also set to respond to NWS test broadcasts. The alarm clock fuctions as an alarm clock with snooze. A large bar on the front turns the radio & alert on & off very conveniently. Once the radio is programmed, it works quite well. I have had numerous Weather radios (and returned many also) and this is the best overall performer yet. WX capability is being added to all sorts of radio products with iffy results. This one works and doesn't cost an arm and a leg. Just keep your manual. The radio was a little complicated to program - took me about 30 minutes to program it for my area. 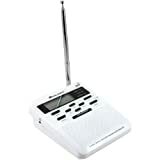 It is a very reliable little radio & it notifies my of any weather statements for my area. The time is VERY hard to read, and even if I leave my contact lenses in, I still can't read it when the room is dark. I have to put my face about a foot from the clock to clearly read the time. Other than that, I like the radio. It has good reception & I'm able to get my local weather forecast instantly. The alert is clear and easy to hear. I bought it more for safety reasons than looks, and it has provided my family with peace of mind in knowing that if severe weather threatens our area, we will be well informed. So far this radio is great. Has all the features needed for emergency notification. Programming was very easy, but keep the manual handy. The back-lit lcd screen is nice and stays on all the time when used with the AC adapter. The weather signal is strong and clear. The 9 volt battery back up lasts about 3 days when the AC is off, so you will need plenty batteries if you are using it without the AC power. So far I have not had an emergency signal come across, so I can not give a review on this. In any case it is a nice unit for the price with many options, i,e external antenna plug, remote speaker or other warning device, earphone, etc. You can also adjust the volume for the alert signal unlike other models. Only draw back; No test feature to check the alarm and warning lights. This radio is a very good weather radio to use. It's "Statement", "Watch", and "Warning" lights are very useful when trying to find out how important the alert is. The clock is a nice thing to have and it will automatically interupt any of the other functions to bring you severe weather. It has a very nice range; I received a weather transmitter from over 75 miles away on it. I like the control that changes the siren volume as it doesn't have to be too loud. The programming is a little difficult, but after you get the hang of it, it isn't that complicated. A very good radio to own for the price. It is also up to date. Per next year, all weather radios are required to have the text display, and this one does. Just a word of warning: The alert siren WILL wake you up; it can be very loud even with the volume turned down. 9. 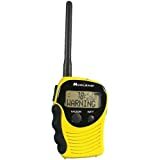 Midland 74-250C Handheld Weather Alert Radio with S.A.M.E. "Q. 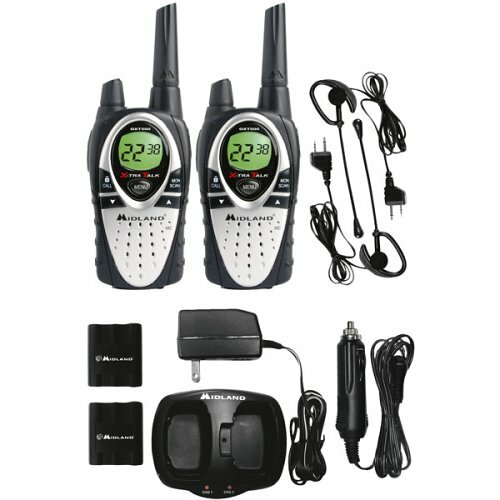 What charger for the 74-250 Handheld Weather Radio? Ans. 200 Milliamp 6volt charger, and please make sure that the plug fits the jack." Midland does not list a charger. 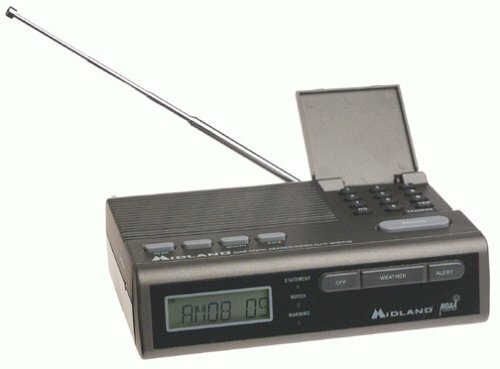 The radio loses the date and time when the batteries are changed, but it keeps the county code. Programming is difficult, keep the manual handy. Both alarms are turned on when the batteries are changed. 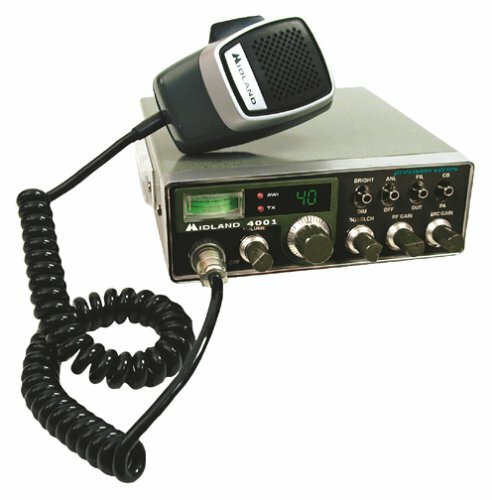 To commemorate its pioneering of CB radio manufacturing, Midland Radio has issued the 40th Anniversary model 4001 CB radio with a silver-finished 1960s styling and an analog power meter. The radio features 40-channel operation, 4 watts of output power (maximum allowable by the FCC), digital tuning, and a PA switch for use with an optional external speaker. The model 4001 will take you back to a time when mobile radio communication was just getting off the ground. Its metallic look, toggle switches (for bright-dim), Automatic Noise Limiter (ANL), filter, and CB-PA functions give this radio a true classic feel. Inside however, you'll find a state-of-the-art, dual-conversion superheterodyne receiver with precision electronic tuning for crystal-clear communication no matter where your travels take you. The 4001 comes with a slide quick-mount with thumbscrew installation so you can easily transfer the radio to a different vehicle or secure it in your home or trunk when it's not in use. A handy lock keeps the microphone from jostling free. Midland continues its tradition of firsts with an industry leading 3-year warranty on this radio. My local Wal-Mart store in Naples, Florida is selling Midland WR-10 Weather Radios for two bucks ($2.00) each! (The radio originally sold for about 30 bucks at Wal-Mart). I bought about a dozen of them to pass out to my friends. The radio does EXACTLY what it's intended to do...give weather information and weather alerts, and it also has the AM and FM bands.You can set the radio to be absolutely quiet until it receives a weather alert. The instructions are very clear and an included pamphlet gives the NOAA weather frequencies for all the major cities in the USA,(which can be easily set at the bottom of the radio). There are a number of other neat features which I won't go into here. So RUN to your local Wal-Mart and see if they still have any left at this absolutely amazing price! My only problem... The radio is made in China, but then, just about everything in Wal-Mart comes from the Orient! I just purchased this radio locally, and I'm going to have to return it. The buttons aren't working. Considering that I've had trouble with another model weather radio from Midland, I wouldn't buy another product made by that company. The Midland WR10 weather radio looks like a good example of industrial design gone bad. The design seems to be based on the company logo - a stylized letter "M". The problem is, assuming you're facing the "front" of the radio, all of the important controls such as the AM/FM radio tuning and volume are on the sides of the radio facing away from the user! I suppose you could operate it by feel, or position the radio backwards, but either way it still seems very awkward. Then again, if you never plan to use the WR10 as an AM/FM radio, it'll probably work just fine. 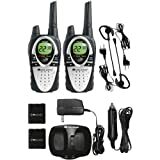 These 2-way radios come with the convenience of both GMRS and FRSchannels. They feature a total of 22 GMRS/FRS channels with up to a seven mile rangewith the GMRS channels. The backlit LCD display offers easy reading in low-lightconditions. The G-227 radios also feature a key lock to prevent accidental channelchanges, and vibrating call alert. If you find yourself in inclement weather, you'llappreciate the water resistant housing. The hands-free VOX feature allows for hands-freeoperation. 836 sub-channels allow for private communicating. The G-227 operates onfour AAA batteries and run for around fifteen hours. Remember that you'll need a FCClicense to operate these powerful radios. Nice features. Range doesn't live up to claim. Love the features, but the range is not as advertised. In my test I used channel 22 on high power. 1/2 mile was about the best it could do. I bought to use playing paintball, so it should be okay for that, but I was also hoping to use it at places like large malls and theme parks to coordinate with the wife in kids. Oh well. I coulnt even get 1 mile. Plain and Simple Dont waste your money. 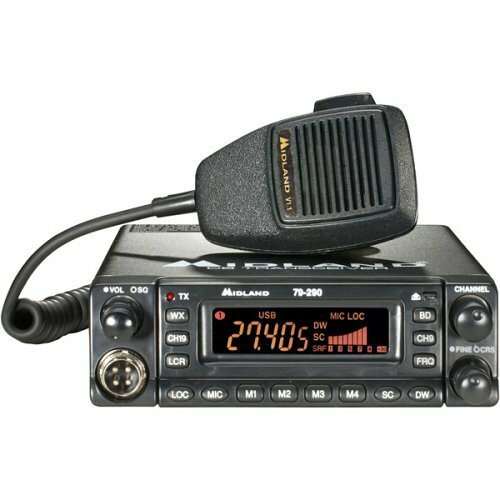 I have gotten farther range on cheap FRS Radios. The GMRS doesnt get any more range. 18. 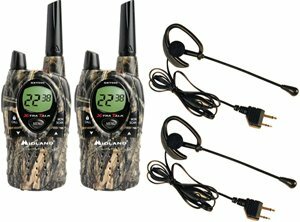 Midland GXT550VP1 Outfitter Series 5 Watt 22 Channel Mossy Oak Break Up Camo GMRS Value Pack with Up to 14 Mile Range, with 2 Headsets"
This FRS radio has fourteen channels and has enough power to communicatewithin a two mile range. Midland claims this radio is the world's smallest, and there's nodoubt that the radio is ultra compact. The radio runs for approximately seven hours usingAAA alkaline batteries. Other features include: eVOX hands free with nine settings,stealth squelch, dual watch, call feature and channel scan. This is a simple to use, no FCClicense required FRS radio.